For this purpose we create a database and a table for ‘ToDo’ list items and display incomplete list items. Incomplete list items can be dragged to completed list items area. After a list item is dragged to completed list items area it is marked as completed in database. With this in mind you are going to perform following tasks. 2. PHP code to connect to database. 4. Display records on page in incomplete todo list items to the left side of page. 5. Incomplete list items will be draggable. 6. Complete list items will be displayed to the right side of the page. 7. Completed list item area will be droppable. 8. Add drag and drop jQuery code. 9. After the item is dragged send an AJAX request to update status of list item as completed. First we create a database test and table listitems and then insert sample data into the table. Here is an explanation about database schema. Database test is created using CREATE DATABASE SQL command. Next table listitems is created for storing list items . Preceding this sample data is inserted into the table. Further todo list items saved in database have name, detail and a flag is_completed fields. Flag values can be ‘yes’ or ‘no’. If a list item is complete is_completed flag is set to yes , otherwise it is set to no. In order to do this create a file named dbconn.php and add following php code. We are going to use mysqli library in dbconn.php. In mysqli() method we pass host, username, password and database name . It returns a connection object in case of success or error other wise. Why we have used MySQLi library? In older php versions mysql_* functions from mysql php library were used. These mysql_* functions are deprecated in newer php versions due the the fact that they were not safe against SQL Injection attacks. Now a days php community recommends to use mysqli or PDO libraries. Mysqli library is used in this tutorial. After connecting to database you need to fetch incomplete and completed list items. Create a file called index.php and add following code. Here in the code above dbconn.php is included so that we can use database connection object. SQL query is created to select all the list items whose is_completed status is no. Next connection object $conn and $sqlIncomplete is passed to mysqli_query() function. mysqli_query() function returns result set which you save in $incomleteItems variable. Moreover mysqli_fetch_all function fetches all the result rows as an associative array. We pass $conn as connection object and result set and save all incomplete list items in $incomleteItems. Next we create query to fetch complete list items. Connection object $conn and $sqlCompleted are passed to mysqli_query() function. This function returns completed list items result set in $completeResult. Moreover mysqli_fetch_all function is used to fetch all the rows from result set and are saved in $completeItems variable. Finally we remove the result set from memory using mysqli_free_result() function. Both results are passed to this function. Connection to mysql database server is closed using mysqli_close(). Add the code below to index.php below the php code. After HTML5 doctype declaration in head section we include jQuery UI CSS. We created custom CSS styles for the DIVs. listitems class is CSS for incomplete list items. You can see we defined height, width, border-color, margin and font-weight etc. Class is applied on all incomplete list items. Next we create CSS style for droppable zone. This div contains completed list items. Code snippet above have a container div. foreach loop iterate through $incomleteItems array. Div inside loop is very important. Div has been assigned classes ui-widget-content and listitems. listitems class is applied to all incomplete to do list items so later we can make these list items as draggable. Inside div tag we created a data attribute as data-itemid and assign item id as its value. Then list item name and detail are dsplayed. Beside incomplete div items you can see the complete list items div. droppable acts as container div for list items that are marked as completed in database or dragged to this area. List items from database are fetched in to an array $completeItems and inside a loop we display completed list items. 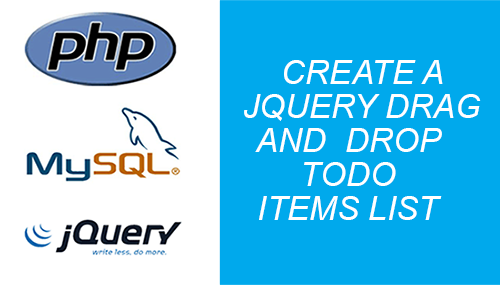 In the code above we have included jQuery and jQuery UI to perform drag and drop. The function above is jQuery function, All the code is placed inside this function block. This function makes sure that the code executes after whole document is loaded. This jQuery code makes all divs with class .listitems as draggable. After applying draggable method you can drag the divs and drop them to droppable div area. After dropping div to droppable an AJAX request is sent to server to update database table and update listitem to is_completed to yes. Here we have a div with id droppable . You can see we have applied droppable method. Inside droppable method we added class ui-state-highlight. When user drags a list item to droppable div, this div highlights. ui.draggable object contains the draggable item. As you know we added a data-itemid as a div attribute. Here we get that attribute using attr method of ui.draggable, In this attr method we pass data-itemid as parameter. This method returns value of this attribute. After the incomplete div item is dragged to the droappable zone. An AJAX request is triggered so we can update the status of list item to completed. In addition jQuery Ajax method is used to send an AJAX request to server. HTTP method used is POST and data is id of incomplete list item as itemid. Post request data is posted to a php page, whose URL is update_item_status.php. As AJAX request completes, response is returned in .done function as data variable. Response is parsed and saved in result variable. We have to connect to database. In order to do this we have included dbconn.php. As we have used method POST in our jQuery AJAX request, in PHP you have to use $_POST super global array. $_POST[‘itemid’] is used to retrieve value of itemid and is saved in $itemid variable. Also we have to execute the query. For this purpose we construct a query to update listitem ‘s status. Here query is passed to Connection object ‘s query method. Next connection to database is closed. After query is executed successfully we returned the success as JSON encoded array to front end. The status of list item is_completed is set to yes. Here is complete source code of tutorial. 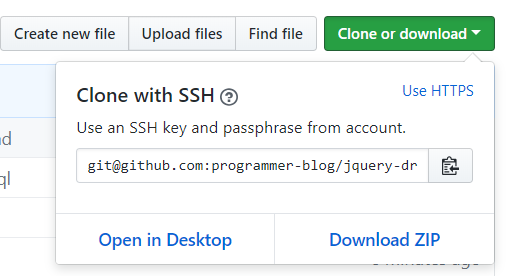 You can download the source code of the article from GitHub. You can clone or download from this link. On the whole, in this tutorial, we first fetched records from the database and created a dynamic jquery drag and drop todo list and applied drag and drop feature. Finally, as the element is dropped, the status of the item is updated in the database table using an AJAX request to the server. Please leave your valuable comments and feedback below.